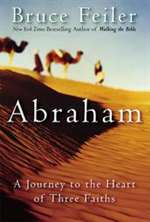 At a moment when the world is asking if the religions can get along, Abraham stands as the shared ancestor of Jews, Christians, and Muslims. He holds the key to our deepest fears â€” and our possible reconciliation. Bruce Feiler set out on a personal quest to better understand our common patriarch. Traveling in war zones, climbing through caves and ancient shrines, and sitting down with the world's leading religious minds, Feiler discovers the untold story of the man who defines faith for half the world.